It's as classic as you get when talking about the early days of LEGO, the wooden duck pull toy. I had the distinct pleasure (and lets face it, stress) of having one in the studio while shooting the animation for the Brickumentary. It had it's own special case and was kept tucked away for security. You could hear angels sing every time I pulled it out for use (ok, maybe just in my head). 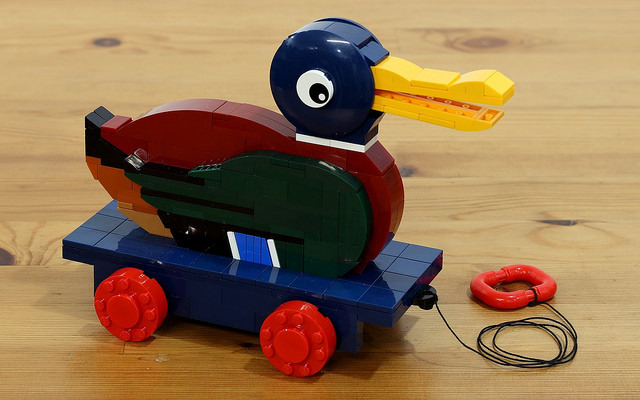 To celebrate the 60th anniversary of the brick builder JK Brickworks is paying tribute to the duck with this brilliant build, and you can have your own because he's released building instructions. Every true fan needs one, build yours today!